In operation since April 2009, Samsung Electronics in Vietnam has more than 100,000 employees working across its manufacturing facilities in the Yen Phong Industrial Zone in Bac Ninh Province (Samsung Electronics Vietnam; SEV) and Pho Yen District in Thai Nguyen Province (Samsung Electronics Vietnam – Thai Nguyen; SEVT). This year, both SEV and SEVT made Vietnam’s “Enterprises for Laborers (Doanh nghiệp vì người lao động) 2017” list, which honored 74 companies across Vietnam that strived to achieve sustainable development by providing a positive work environment for their employees. Both entities were also among the top 30 companies that were awarded the Certificate of Merit by the Vietnam General Confederation of Labor (VGCL) for their outstanding achievement. The “Enterprises for Laborers” rating is based on a specific set of criteria developed by labor and trade experts. The criteria ensure a close reflection of the actual use and treatment of employees in the company in a wide range of standards from vocational training to mental well-being. Special priority is given to enterprises that have better welfare for employees and implementation of laws in place. The listed companies are also consulted on various aspects with the Vietnamese Ministry of Labor – Invalids and Social Affairs (MOLISA). The Certificate of Merit is awarded to companies that achieved outstanding results in taking care of the well-being of their employees, in addition to protecting their legitimate rights and interests. The awardees, including SEV and SEVT, were recognized as companies that exemplify their belief that humans are the core value and the driving force for the development of enterprises. 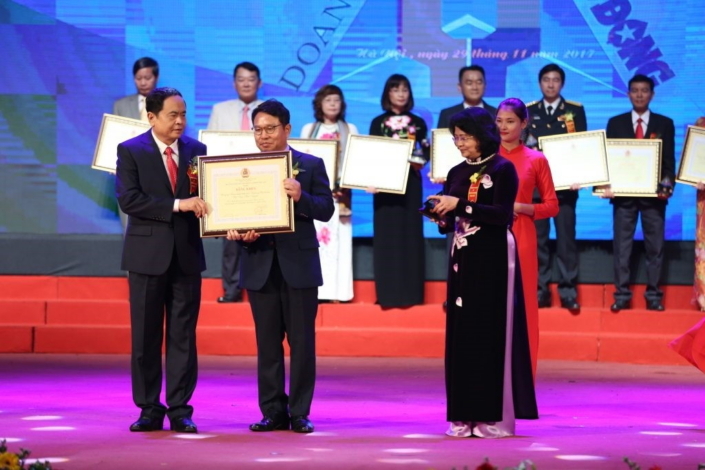 In the awards ceremony held in Hanoi on November 29, 2017, the representatives of SEV and SEVT were given the Certificate of Merit and its trophy by Madam Dang Thi Ngoc Thinh, Vice President of Vietnam and Mr. Tran Thanh Man, Chairman of the Vietnam Fatherland Front. Samsung in Vietnam provides a professional and healthy environment for its employees that ensures their well-being. Among the various benefits SEV provides for employees, the company was in particular recognized for its maternity support, including special treatment for pregnant employees. The company also provides modern housing and amenities, which includes a dormitory that comes with cinema, welfare rooms, a supermarket, a hair salon, a yoga room and a gym. SEVT, a company with more than 68,000 employees, also has systems in place to make their employees’ lives easier, such as 550 high-quality vehicles that pick-up employees daily from the neighboring provinces. Like SEV, employees are provided with an excellent living experience with a dormitory of 26 buildings which accommodates more than 22,000 employees and is equipped with quality amenities. Samsung, as it continues its operations in Vietnam, will remain committed to ensuring the well-being of its employees there, as well as identifying new avenues for their growth and training, and job satisfaction. In Vietnam, the “Enterprises for Laborers” ranking is announced every year under the goal of creating a broader movement of encouraging businesses to care more about human resources, development of enterprises and communities. Organized by Lao Dong Newspaper since 2014, the list is initiated by VGCL in cooperation with MOLISA and the Vietnam Chamber of Commerce and Industry (VCCI).